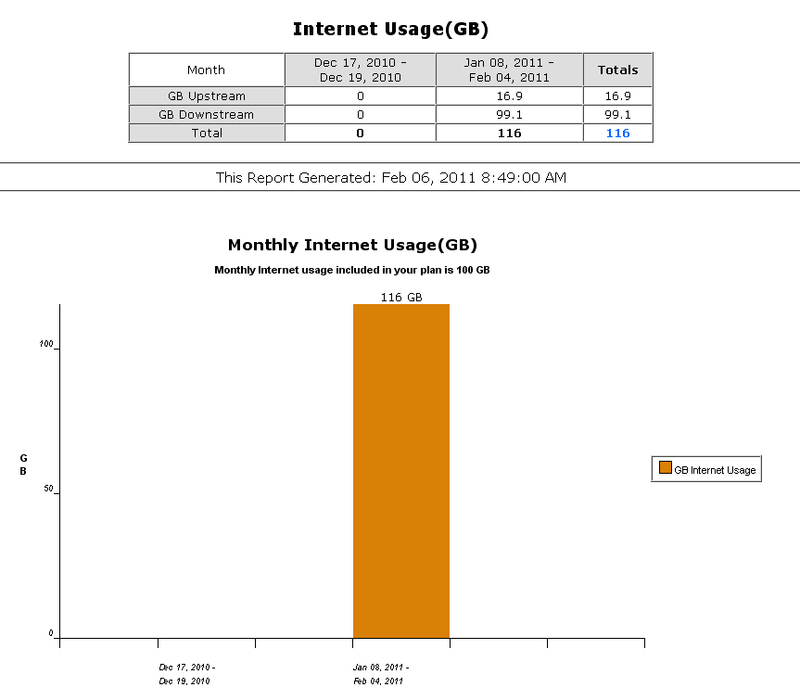 So an extra $10.00 per month will almost put us back to where we were before the case of the disappearing 25gb, but again, I reiterate – why should we have to pay extra for what we already had. We received no advance notice of the cap decrease, and we certainly didn’t receive a decrease in fees. There has been much discussion of late on various community forums, most notably on Broadband Reports , and the discussion is not of a happy tone. Going back to our phone calls with Shaw yesterday – the second  phone call was a simple removal and realignment of some of our digital channels, because while we can add to our Digital TV channels through Shaw’s site, we can’t remove them. The CSR I spoke with on this call was also affected by the cap decrease, as she also suffered from 25gb of missing transfer allowance. It would be nice if we could just completely remove the channels we definitely never watch, like the French ones that our language laws require be offered in every home (sorry, Quebec), Speed, E!, Cosmopolitan TV and The Shopping Channel, along with a few others we simply don’t watch. About the only time we watch Spike is for the Video Game Awards, and if the quality of that show doesn’t improve, we won’t be watching that anymore either. If the cable companies can micro-manage what digital channels we do or don’t have, why can’t we have full choice for options on plans involving Digital TV? But I digress from the internet issue. I just found out where our 25gb went. In looking at an old “Benefits ” statement from Shaw – the original file name had “0607” in it, so it’s possibly from 2007, but the Nitro transfer limit is listed as 150gb, and in the current packages listing, it’s 175gb. There are no limits stated for the “lesser” packages, though – I find this somewhat telling, don’t you? 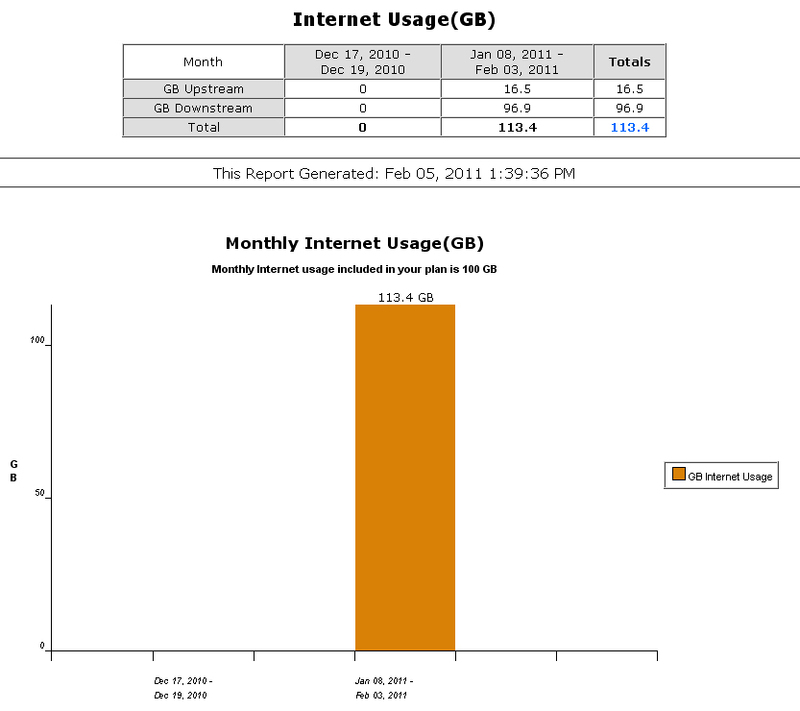 Nitro got a cap increase while all of the other plans got data transfer limits lowered. Skipping forward about a decade, in Shaw’s 2008 Annual Information Package , the corporation was touting the wonders of its internet service, presumably to its shareholders and executive body. I then switched my focus over to the even drier Terms and Conditions  page – where they tell you tons of things you don’t need to know, and tons of stuff you should know, and even where they say they are supposed to notify you of any policy changes. Well – at the top of the page it states “Last Updated on December 15, 2010.” I didn’t get an email stating that there had been policy changes or what those changes were, did you? Considering this appears to be around the time that transfer allowances seem to have been dropping, maybe they were hoping that by not sending out the policy change notice, attention wouldn’t be drawn to the shrinking caps. Then of course I started to doubt my memory, wondering if maybe Shaw did send out an email and I’d somehow missed it. Well, according to the irate people on Shaw’s Facebook page , no notice was sent out and the people representing Shaw on the page aren’t quite being truthful – and they are being called to task for it. Next option was to get Nitro (if and when it becomes available here) and using that to watch TV, but as Scott pointed out, not all of the shows we watch are available through network web sites, and we wouldn’t be able to PVR what we miss when we’re out at industry events. Of course then our subscription fees wouldn’t be going to support the Canadian stations we have in our digital line-up. The fees do benefit the individual channels, right? 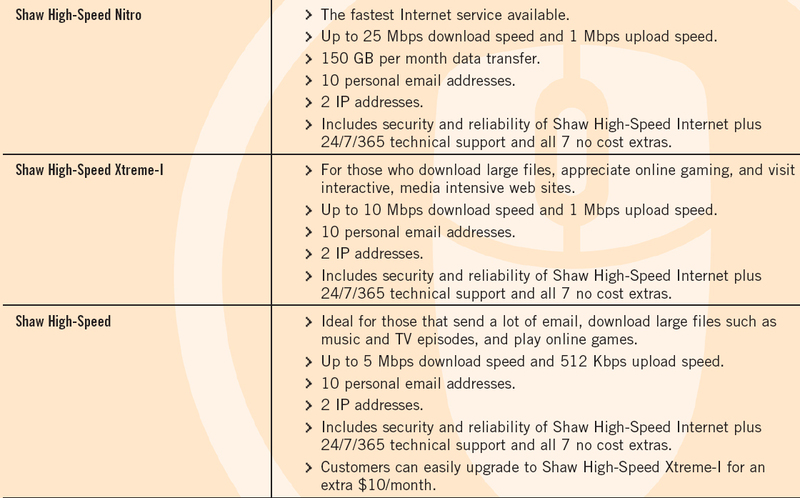 Now, something I noticed in the Terms and Conditions, where it lists all of the internet plans and transfer caps, is that some of the plans can’t be found on Shaw’s web site through direct links. Two that come immediately to mind are the SOHO and Entrepreneur plans. 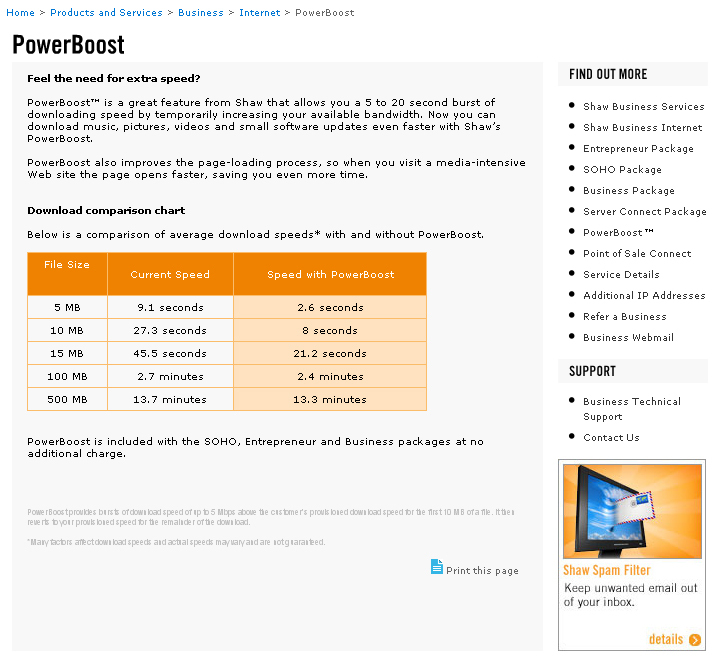 They are still listed in the sidebar if you click through to read about PowerBoost , but you can’t click the titles any more. So those have been taken away as well? Just two weeks ago I was talking with a Shaw Business rep because we’re looking at changing over the service at my day job from Telus to Shaw, and he said the Entrepreneur package would probably be the right plan for that office. Well, now I want to look at the plan, and both SOHO and Entrepreneur are no longer anywhere to be found on the Shaw site – even though I’ve looked at them before. 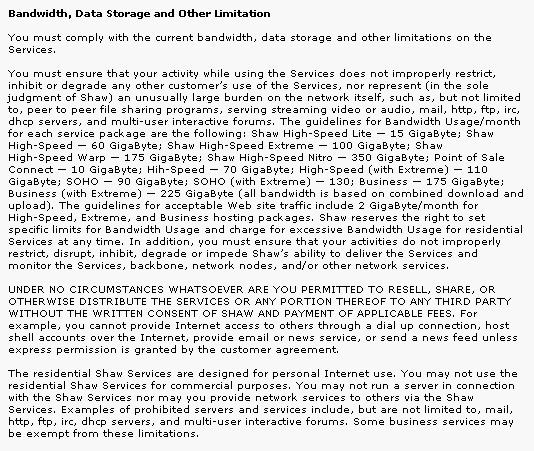 I just noticed as well that the person who typed up the new terms and conditions for bandwidth usage must have been in a hurry, because he or she made a typing mistake.